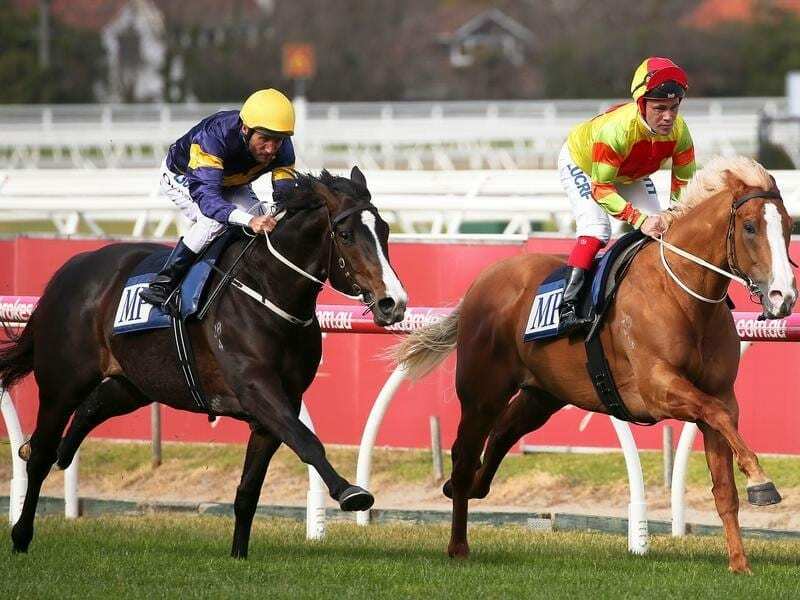 Mighty Boss (right) will be one of two Mick Price-trained runners in the Dato Tan Chin Nam Stakes. Trainer Mick Price will take Mighty Boss to gallop at Moonee Valley ahead of his next start in the Dato Tan Chin Nam Stakes. The Group Two race will be run on Saturday and Price says it is his intention to give Mighty Boss a look at the track on Tuesday morning. Mighty Boss finished fourth behind Showtime in the Bill Stutt Stakes last year at his only Moonee Valley outing before going on to win the Caulfield Guineas. Price decided to run Mighty Boss in the Dato Tan after he finished 11th in the P B Lawrence Stakes first-up at Caulfield last month. “He needs a mile now and Michael Walker is adamant he’ll get 2000 metres and beyond,” Price said. “He’s getting better and better but he needs racing. He’s a gross horse. Price says he is working towards a Caulfield Cup start with Mighty Boss but his lead-up form will determine whether he runs. “A horse like him you’d need to see a reasonable amount of form to put him in the race,” Price said. “The Turnbull Stakes is going to be one of the toughest races of the spring but its the Caulfield Cup lead-up. Price will need a new rider on Saturday with Walker suspended following his victory on Comin’ Through in the Tramway Stakes at Randwick. Stablemate Hiyaam is also to run following her first-up sixth over 1519m on August 25. Price said the Dato Tan Chin Nam suited her program towards the Caulfield Cup. “Two 1400-metre races didn’t suit, a 1500-metre handicap didn’t suit but a mile at weight-for-age, they’ll sit up a bit and she’ll get off the bridle and chase home,” Price said.